Wish you a pleasant & safe return home. Thanks your interesting letter. regarding Mr McCabe's reference to	the advent of sound in the L&H book, I do'nt think he intimated that we did'nt realise the importance of sound & the wonderful new opportunities it afforded us - I can assure you, it gave us new life & enthusiasm. Re the Cry mannerism - this for some reason had big appeal to many of our Fans & became a trade mark along with 'Ollie's' Tie-twiddle & my business of scratching my head, but I must confess it was one of my pet aversion's - I tried many times to discard it, but was always persuaded to continue. Anyway, its water under the bridge now. Again my thanks for your kindly interest & sentiments. My kindest regards & every good wish to your Brother Bob & Self. Am sure you had a wonderful time visiting your brother Bill & his wife, & their animal family, thats quite a troupe to have to shake hands with - imagine if they all wanted autographs.!! The Roast turkey sounds very inviting - I guess after you all got through will that you wanted to 'Sing along with Mitch'.!!!. Pleased to note you're feeling so much better Marie & the kidney dept. is clearing up. Yes I saw Jerry Lewis on the Sullivan show, that was a re-run which was taped sometime ago - do'nt give me any credit for his improvement - Jerry only listens to Jerry.!!. Weather here is very hot, but the ice cream wagons out front here help to look cool, & such divine music. Drives you SCREWY.!! Thanks for the cartoon clippings - very cute. Mrs L. joins in regards & best to yourselves & Mother. In the 1960s, Mitch Miller became a household name with his television show Sing Along With Mitch, a sing-along program featuring him and a male choir. Miller coined the catch phrase “All Smiles.” These were preceded by the instructions to “sing along, just follow the bouncing ball” (a large dot that “bounced” above the words that were superimposed on television of the song that Mitch was singing). Shall be pleased to get some copies of the Stills you mention - appreciate your kind gesture. Incidently, you mention Mae Busch being in the "Blockheads" film - that was'nt Mae Busch, it WAS Minna Gombel. Regarding the voice situation for the L&H cartoons - I frankly do'nt know if anyone has been chosen or not - interesting to hear about the L&H L.P. record - if you happen to locate this recording I would like very much to have a tape copy of it & I'd like the copy of John McCabe on the Joe Franklin show you mention too. Again my thanks & best wishes. Please convey my best to Chuck McCann. Joseph Franklin (born 1926) is an American radio and television personality. Franklin hosted the first television talk show in America in 1950 on WJZ-TV (later WABC-TV) and moved to WOR-TV (later WWOR-TV) from 1962 to 1993. Known as “the king of nostalgia,” Franklin’s highly-rated show focused on old-time show-business personalities. Thanks your letter enclosed with photograph of Norman Wisdom & L&H - I believe this picture was made in 1952 at the Prince of Wales Theatre in London. With pleasure I have autographed it for you & am returning it herewith, trust it will reach you safely - undamaged. Please convey my regards & best to Norman when you centact him. Hope you had an enjoyable trip through Spain & France - I understand our films are still quite popular over there. All for now. 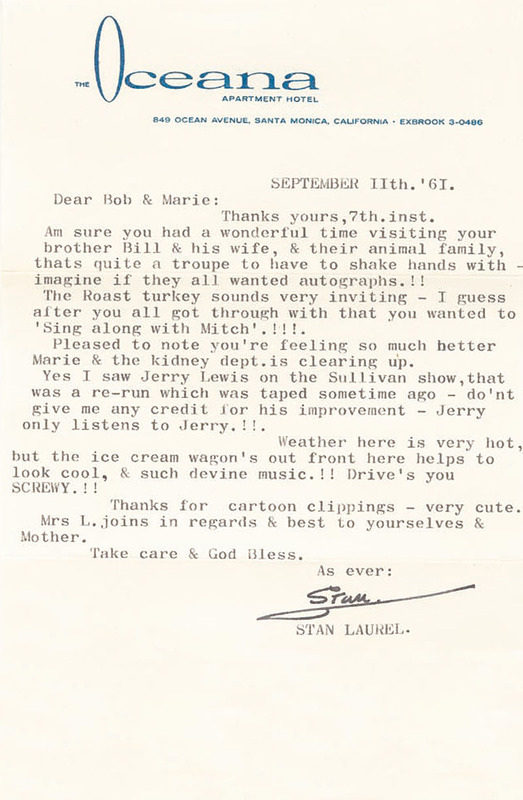 Thanks your nice letter conveying good wishes on the new L&H series - incidently, this series will be animated cartoons - the characters of course will be of L&H - each segment will be a complete story idea, similar to our old two-reelers. Regarding the L&H story, this has been postponed indefinitely - the last I heard, Jackie Gleason & Art Carney have been chosen to play the L&H roles. Sorry I have'nt any articles or souvenirs of L&H ,otherwise I would have with pleasure sent you something - after Mr Hardy passed on I gave away all the old costumes etc. to the salvation army & Goodwill organizations - got rid of everything. I'm happy to know the old films have given you so much pleasure thru the years. P.S. Thought you might be interested to know, a book was published by Doubleday Co. recently, titled "MR LAUREL & MR HARDY", by John McCabe. check with your local hook shop for further details. Yes, I had a nice letter from Bed Chadwell - told me he was leaving for Europe shortly, also mentioned you had acquired several L&H films & he was going to attend the Premiere before he left. That sound proof Booth is a very good idea, those Bell & Howell projectors are generally very noisy & overshadow the sound, very disturbing & annoying. Is your booth portable? they're nice to have in the event you run the films outdoors during the summer in the Garden (HOME DRIVE-IN)!! Re the Hedge Maze in "Chump At Oxford" the Full Long Shot scene of this was actually painted on glass, I believe the original setting is the one & only Maze which is located in Hampton Court in London, Eng. The hedge maze we worked in was built on a stage at the studio in two sections, every scene was made in the same set, but each scene we changed different objects, such as a statue - a bench - an exit sign, etc. which give the impression the maze was endless - incidentally they were real live hedges, actually growing at the studio, they were replanted after the film was finished, & still there I guess. I doubt if the "Music Box" Steps would be located now, I remember they were somewhere South of Hollywood Blvd. in L.A. But so many changes have been made since then - Freeways etc. the steps could be seen very easily at the time we used them as there was a great deal of vacant property. I imagine that section is all built up now & probably the steps are no longer in view. The home in "Big Business" was in Cheviot Hills, but have no idea of the street name, I guess the house is still there. "Finishing Touch" was also made in Cheviot Hills we used some vacant lots & erected the frame of the house we used in the film. I too recd. nice acknowledgements from your friends in response to the books. Incidently, I appreciated your kind thought & gesture in the purchase of these books. Shall look forward to seeing you again when Ben returns from his trip. Just found out I am subject to High Blood pressure so now I've got something new to worry about.!!! Bye Tom - Mrs L. joins in kind thoughts to yourself & Family. The house Stan, Ollie and James Finlayson wrecked in Big Business is located at 10281 Dunleer Drive, Cheviot Hills, Los Angeles. Regarding to showing of the L&H cartoon series, they will not be released till sometime in '62. I do'nt know frankly who will do the voices for the characters, but you can rest assured there will be a careful selection made. During Mr Hardy's career his weight varied from around 275 lbs & up, mine was from 165 to 175. When we returned from our tours Abroad in '54, Mr Hardy was 360 lbs. Its very difficult to say which film I liked best - its like asking someone with 12 kids, which they like best.! The ear wiggling gag was done with threads attached to the back of the ears & the use of a slow speed on the camera. Thanks for the snapshot of your boys, Victor & Glen, they're very cute kids. Nice to hear from you, but sorry to know of your ill health & your occasional visits to St John's for treatment - pleased to know you are feeling much better now - hope you're taking good care of yourself. Have'nt been feeling too good of late, high blood pressure business or something, have never had this nonsense before, so now have this to worry about - BLIMEY.!! Eda joins in every good wish, hope to see you sometime. The films that were made at 20th Century Fox were very poor. Nice to hear from you - pleased to know the old L&H films being enjoyed over there - appreciate very much your kind sentiments. I agree with you fully, the films that were made at 20th Century Fox were very poor. We were very unhappy with them - our films at the Hal Roach Studio (M.G.M. release) were made & supervised by us, we did what we felt was funny & were not hampered by anyone, at the other studios, we had no say in the matter, were told what to do, when & HOW. The stories that were written for us, we objected to & were told if we did'nt like them, we knew where the studio gate was.! so we finally decided to Quit - unfortunately, too late the damage was done. The 'Robinson Crusoe' debacle was made in France, in this we had no say whatsoever - plus language barrier & sickness. A NIGHTMARE.! This of course ended our career in films. Anyway thats water under the bridge now, but still a very unhappy memory. Regarding Jimmy Finlayson, sorry to say, he passed on in '53. we were very fond of Jimmy, a great character comic & a wonderful guy. God Bless Him.! A book was published here recently titled: "MR LAUREL & MR HARDY" by John McCabe. I understand it is now being distributed in England (Gt.Brit.) by the Museum Press Ltd. in London. - 26, Old Brompton Road, S.W.7. this covers the career of L&H. Not much else to tell you, so bye for now.